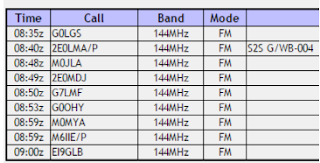 M0PLA/P SOTA Activations: 25th March 2017. G/WB-015 SOTA Activation visit. G/WB-015 Callow Hill. 25th March 2017. Grid SO 460850 . Altitude 336M. Flounders' Folly our summit location. Today's visit was Michelle (XYL) and myself as Jamie was away in Italy. We started our ascent and I had decided to go straight up, this was too much for Michelle so she turned around half way up and headed back to the car. As seen from the photo above the ascent was very steep and muddy, I must admit by the time I reached the summit I had a few sweat streaks running down my forehead. (Not a recommended ascent route). The preferred route I think was my descent route. 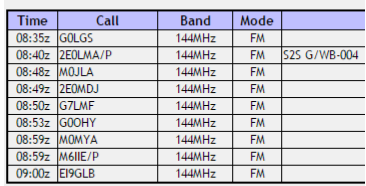 I was happy with my activation on 2M, I did try using my handheld to start with but there seems to be a problem with it so after my first QSO I reverted back to my Yaesu FT 817. My final QSO was with EI9GLB (Jim) this was my second activation with Jim as I spoke with him last week at GW.NW-018, there seemed to be a lift on. The first photo I took at the summit was myself and the gate (my forehead tells it all). After 25 minutes and 9 QSO's one being a S2S with 2E0LMA (Lee) it was time to pack up and head to my second summit of the day, as I said I had decided that my ascent route was not a good descent route as it was too steep and with the wet ground I didn't want to end up with an injury.